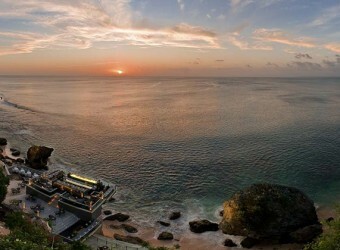 Bali Restaurant Rock Bar is located in Ayana Resort, Jimbaran. This bar built on the rock overlooking the ocean. Enjoy a romantic moment and watching beautiful sunset in Indian Ocean. The Rock Bar serves a variety of cocktails. You can enjoy the stunning view from the cliff sets. Sunset time is very crowded, so highly recommended to come early. It’s located in the edge of the island and it offers the breathtaking sea view. I think here is one of the best places to watch the sunset. I recommend you this bar if you stay at Ayana Resort.